LENEXA, KAN. – Thanks to aging baby boomers and their complete comfort with growing older, gray is expected to be the rising color of choice for roofs across America in 2015. According to national color expert Kate Smith, with the youngest baby boomers now in their 50s, the generation that redefined traditional values is now making new rules for how homeowners live during the second half of their lives. The boomers, always seen as different from those who had come before, appear very comfortable simply being themselves. More grounded and balanced than they were as teens, the boomers are embracing “going gray” and doing it differently than their parents and grandparents. Owning the majority of homes in America and having the resources to remodel and redecorate means that boomers wield influence that has been unmatched by previous generations of seniors. Gravitating towards gray — in all of its many shades — combined with warm neutrals, sets the stage for people to personalize a home color scheme that is as unique as those who rocked the 60’s. The color trends forecaster believes that the introspective side of soul searching by baby boomers is reflected in them placing more value on their time, relationships and privacy. “A simpler palette of colors — gray, beige, ethereal blue or green combined with deep brown or black — give us the foundation for exploring ourselves and the world around us from the sanctity of our home,” says Smith, who serves as a color consultant for DaVinci Roofscapes®. Smith, who authored the “FRESH Color Schemes for Your Home” and “FRESH Exterior Home Colors” e-books available free from DaVinci, sees today’s homeowners as having a “renewed sense of self” that instills a feeling of exuberance at living life. “Whether close to home or around the world, a taste for the exotic and unknown captivates our imagination and design sense,” says Smith. “Complex patterns, intricate designs, mosaic tiles, embossed leather and decorated metals combined with weathered or toned down bright colors such as Frank Blue, Nifty Turquoise or Cranapple, visually help communicate our enthusiasm for life. “These are expressive and playful colors, with a dash of bohemian and a pinch of sophistication. Adding one of these confident colors to a home exterior area, like the front door or trim, can update any home scheme and create a joyful feeling every time residents come home. 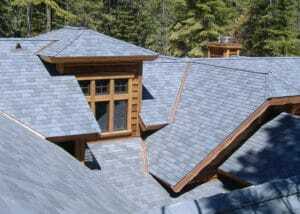 The addition of a storm gray or classic gray polymer slate or shake roof overhead caps off this feeling of security and stability in the home by uniting the entire exterior. For additional color insights for the roof and home, visit www.davinciroofscapes.com and www.sensationalcolor.com.